Established in 1950, the Israel Army Radio ("Galatz" or just "IDF Radio") is probably the only military radio station in the world of its kind. Combining first-class news editions and reports, up-to-date rock & pop, programs for teenagers, adults and soldiers, pluralistic and saucy - it's still very popular, even more than most commercial radio stations in Israel. If you've seen the movie "Good Morning Vietnam" starring Robin Williams - forget it. It's nothing like that. 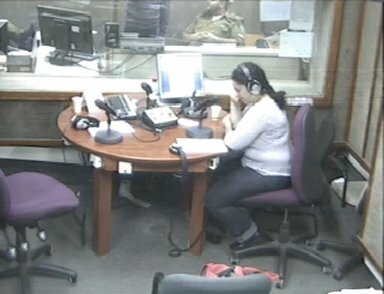 About half of the IDF radio station in Jaffa is being run by young soldiers, aged 18-21. The senior editors are usually civillians, regular full-time workers, fully paid by the army. The station's chief is appointed by the minister of defence, and usually has a record of both media and defence work. The soldiers work as producers, program editors, live reporters, audio technicians, DJ's and musical editors. The young IDF radio soldiers do most of the dirty work. Is it "normal" for journalists to run around in uniform, hang out around army generals and politicans, and ask hard questions? well, it isn't. But Israel is not a normal country. Israel is a post-democracy, operating an anti-democratic military occupation over the Palestinian people, and living in constant fear of destruction from hostile neighbours. The small Jewish-Arab state (6.1 million Jews, 1.6 million Israeli Arab citizens, 3 million non-citizen Palestinians) is still living the memory of the Jewish Holocaust ("Shoa"), which wiped out 1/3 of the entire Jewish people between the years 1940-1945. 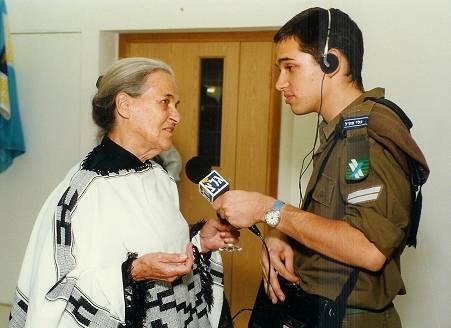 Since the Israeli Defence Force (IDF) is an integral part of Israeli life, the Israel army radio is also an integral part of the Israeli media. The young soldiers bring "new blood" to the "closed" military system, forcing the older editors to pick up on the latest trends. The constant changes in manpower create a dynamic work-zone. But first let's make one thing clear - in Israel, Military service is compulsory - almost every 18-year-old, male or female, must join the Army. It's the law - what can you do? Males serve 3 years (officers serve 4), females serve 1 year and 9 months (or 2 years max.). About 30% of the Israeli youth don't get recruited at all - not everyone fit the minimal requirements, and not everyone are Jewish - the IDF recruites only Jewish, Druze, Cherkesian & Beduine citizens. Many ultra-orthodox Jews are not recruited, a fact which causes considerable political & social tensions between Israelis. 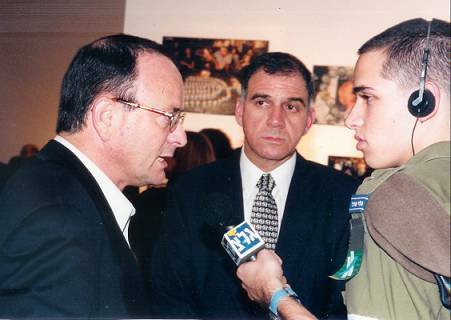 Some of the soldiers who excell in their jobs receive immediate offers from well-known newspapers and TV channels in Israel, like Yediot Aharonot, Maariv, Haaretz, Channel 2, Channel 10, the governmental KAN, and more. The army radio's name is pronounced "Galey-Tzahal" in Hebrew, which means "IDF waves". The word "Tzahal" is short for the Hebrew term "Tzva Haagana Le'Israel" (Israel's Defence Force). The station was first established in 1950, by prime minister (and minister of defence) David Ben-Gurion. Operated inside the "Hamanchil" school in Ramat-Gan, it was moved to its current main building in Jaffa, on May 1958. Current station address: IDF Radio's main building is located at Jaffa's 21 Yehuda Hayamit street, or more precisely, 23 Dror street. Jaffa is the southern part of the city of Tel-Aviv, not very far away from the mediterranean shoreline. 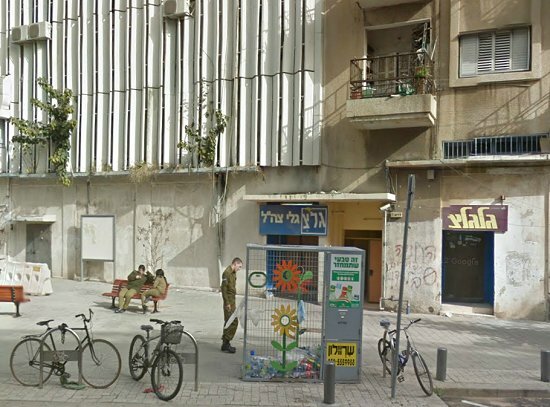 The IDF planned to move the station's Jaffa building to the city of Lod, with the working date suposed to be 2016. The decision was first made by Israeli defence minister, Moshe Ye'elon, and the station chief at the time, Yaron Dekel. Planning has began in 2014. In 2018 it was decided to move the main station building to "Beit Hachayal" in Jerusalem. Transition is planned for 2021 or 2022 at the latest. Although the IDF radio station is only a military unit, it actually broadcasts to all of Israel - from the north, where the soldiers are serving in the Lebanon & Syrian borders, to sunny Eilat in the south, meeting Egypt and Jordan. Now that GLZ is fully online, it also broadcasts to Israelis everywhere, even in the USA. 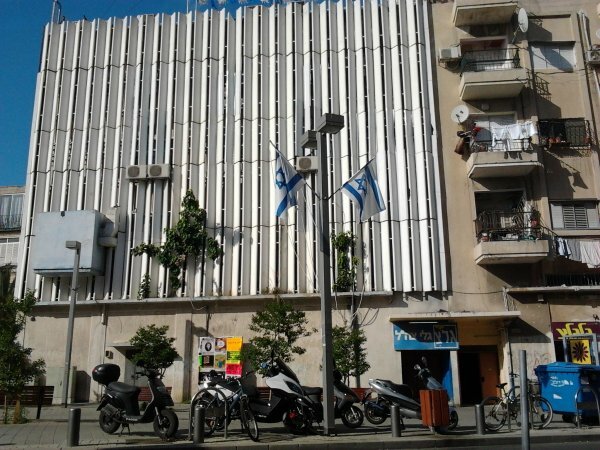 The Israel army radio operates a second studio operation at the heart of Jerusalem, just 1 mile from the Knesset (Israeli parliament) and the Israeli high court. The Jerusalem studio, located in "Beit Hachayal" ('the soldier's house') is used mostly for live news broadcasts. The GLZ Jerusalem studio is named after the late Amiram Nir (1950-1988), who participated in the Iran-Contras scandal, and was killed in a mysterious helicopter accident in Mexico. Nir was married to the wealthy Judy Nir Shalom Nir-Mozes, who donated the funds to help complete the GLZ Jerusalem studio. The Jersualem studio is set to expand and replace the Jaffa headquarters. The third Galey-Tzahal studio is located in Haifa. 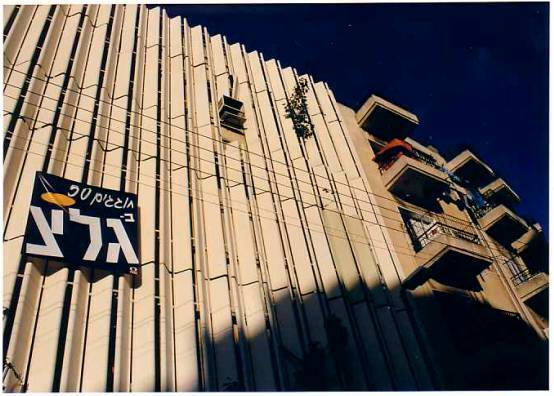 This one-room operation, in the Hadar HaCarmel district, is serving the station's reports about the northern part of Israel. It is mainly being used by journalist Kobi Mandel and for news reports about Haifa, South Lebanon and Hezbollah. 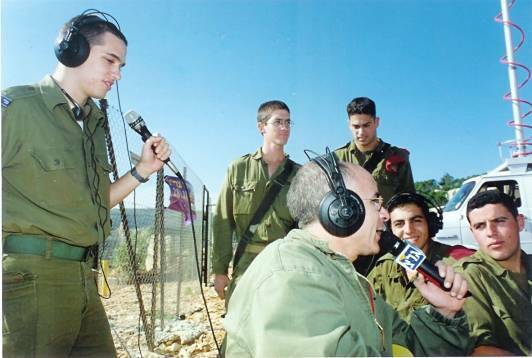 The Israeli Army Radio became the most popular station for the younger generation of Israelis - from 6 to 46, 24 hours a day, seven days a week, 364 days a year (most radio stations in Israel shut down at "Yom Kippur"), FM and AM. Mobile phone users can download the GLZ app on Android's Google Play or the iOS Apple App Store. The app features a rich archive, podcasts, live streaming and genre-based streams. For many years, Galey Tzahal's only direct competitors were the people in the governmental IBA - Israel Broadcasting Authority. Now that the IBA has been dismantled, the Israeli Public Broadcasting Corporation (IPBC) has been branded as "KAN". Before the IPBC, the army radio has become more popular than the IBA radio stations, which have stagnated under constant political pressures and lack of economic motivation. One important factor in the station's popularity, is that fact that since 1993 it also operates its own separate music channel. It's called "GAL-GALATZ". The name 'Galgalatz' is a combination of the Hebrew word 'Galgal' (meaning: wheel) and 'Galatz' (IDF Radio). This 2nd operation is located inside the main Galatz buliding in Jaffa, but it broadcasts to civilian drivers, all over Israel. Besides providing live traffic bulletins and news digests, it programs rock & pop hits, both Israeli and Anglo-American music. The station's overall yearly budget is around 40 million Shekels (ILS). Income from sponsorships & limited commercials is around 20 million Shekels a year. The rest comes from the Israeli ministry of defence. In recent years, most of the station's income derives from commercials, with the MOD providing less and less funds. I served 3.5 years in the station. They used to add a 6-month-extra-service back then, but now it's cancelled. I was supposed to join the paratroops - but luckily for me, I broke my right arm while training for the service. Before I started my service, I went through a 1-month course in basic radio journalism. I served as an editor and reporter for arts & entertainment. It sounds great, I know - going to theater and ballet shows, operas and rock concerts. It was great - but it was also pretty hard work. Waking up at 5:30 every morning and going to sleep at about 1am. I was so tired, all th etime. It was a full-time job, and I was exhausted most of the time. I worked on weekends, too. I got to travel all over Israel (which is small, but diverse), met hundreds of artists, musicians, impresarios, politicians, agents and actors - every day. I'm very proud of the investigative journalism pieces I've worked on - some of them broke headlines and casued a stir. I even went 'undercover' a few times, to get exclusive recordings and interview people in the news. I will always remember the phone interview with Irish singer Sinead O'connor, when she got death threats from an Israeli right-wing lunatic, Itamar Ben-Gvir. I also covered a lot of funerals, press conferences and political scandals involving the ministry of culture. But that doesn't mean that I wasn't a soldier - almost all the reporters wear uniform all the time, I guarded my base (which is the station building) with an American M-16 rifle, I went to a shooting range every 4 months, cleaned my department for the weekly inspection and of course - never said anything terribly "negative" about the IDF on the air. It's logical - after all, the station belongs to the army. Thousands of young Israelis try to get in 'Galey Tzahal' every year. Only about 30 make it pass the tests each year. I wasn't better than the rest of the applicants, just luckier. Although I've been part of the IAR through 1995-1999, I have served there once in a while as a "reserve soldier", in civilian clothes. This means you can't really leave the station until you're about 40, if you're male (most females don't serve in the reserves). It was an exciting, hard and challanging experience. It really opened my eyes to the world - understanding how the entertainment industry works, how artists behave and react to the media, and how politicians choose to deal with artists who need public funding. It also helped me build the Mitkadem website, focused on the music I love (prog-rock). If you want some more info on the station, email me. 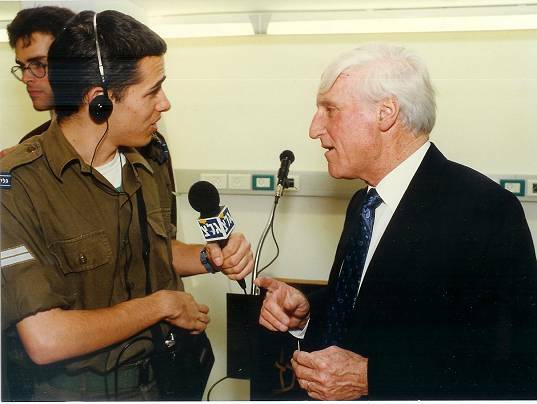 In 2004, Jonathan Gadir from Australia's ABC radio network interviewed me for a media report. IDF radio website screenshot (Feb-2014) If you understand Hebrew - the Israel Army Radio official site is GLZ.co.il - it has online news and some basic information on the station. If you have the Microsoft Media player plug-in, you can listen to the GLZ online live broadcast, and even look inside the studio, using their live public webcam. Frankly speaking, it's the coolest thing on the site. Want to know what the Israeli press thought about my military service? Orna Porat (1924-2015), one of Israel's prominent actresses, interviewed by Uri Breitman in an honorary PhD award at Weizmann institute. 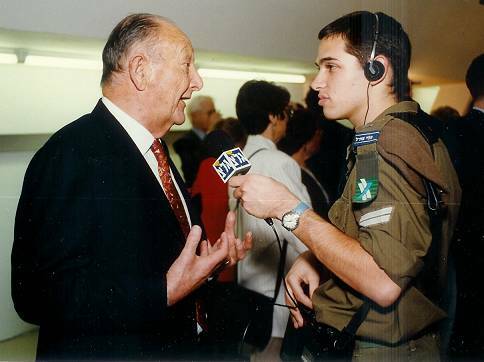 Roni Milo (born 1949), Mayor of Tel Aviv during the 90's, interviewed by Uri Breitman; Also served as minister of health, minister of labour & welfare, minister of police, minister of ecology, minister of regional co-operation. 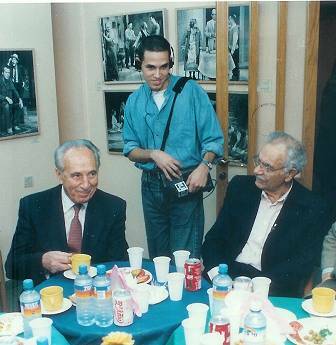 Shimon Peres (born 1923) & Yosi Yadin (1920-2001), interviewed by Uri Breitman at the Cameri Theatre in Tel Aviv; Peres was prime minister of Israel twice (1984-1986; 1995-1996). Yadin was one of the founders of the Cameri Theater. Shlomo Lahat (born 1927), mayor of Tel Aviv in the years 1973-1993. Interviewed by Uri Breitman in 1996. Ted Arison (1924-1999) was the world's wealthiest Jew. Arison made his fortune through the "Carnival Cruise" company. Interviewed by Uri Breitman at an honorary PhD ceremony at Weizmann Institute. Teddy Kollek (1911-2007), mayor of Jerusalem in 1965-1993. 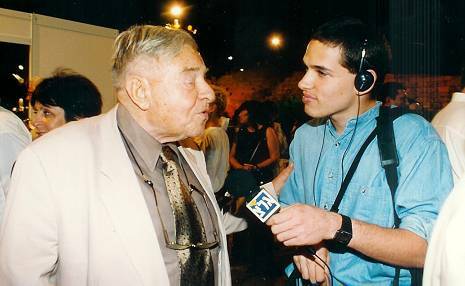 Interviewed by Uri Breitman in the spring of 1996. Yehoshua Sobol (born 1939), Israel's most famous contemporary playwright, interviewed by Uri Breitman in 1997. 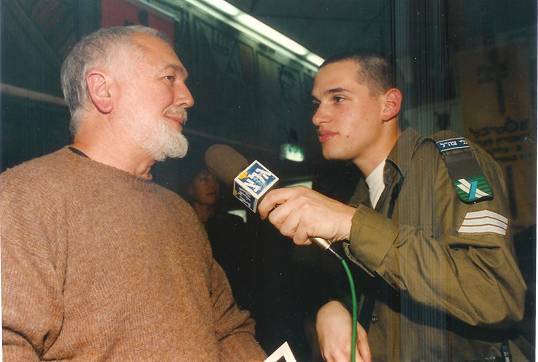 Yaakov Cohen, Cameri Theater actor, with Uri Breitman at an Israeli Army Radio visit to a northern army base, at a special program of "Bilooy Nayim" hosted by old-time host, Muli Shapira, in 1997.